It’s good to be back. I’ve been away since mid-September and although I generally thrive on travel the last few weeks I’ve been homesick to such an extent I couldn’t bare to access the internet or even check my e-mails. Looking down the garden mid-summer. It didn’t used to be such a wrench. I’ve been globe-trotting since child-hood. Dad was a civil engineer and most of his ‘projects’ were based overseas. We hardly lived anywhere longer than a couple of years so rarely put down roots. Home never meant belonging and I grew up believing that mine was a ‘gypsy’ soul. Friends were always few as I itched to move on, to discover just what lay beyond the next horizon. What ties I owned were weak and unsentimental. Yet I was always jealous of people who ‘belonged’ and wished I could claim one place as home. And I suppose that’s why I’ve always loved history. While the present world is always in flux there is a sense of permanence about things past. History exists in the mind’s eye and therefore can’t disappoint or betray expectations. Anyway, that’s my excuse, or perhaps it’s more an apology? With that in mind our latest round of travels began in Italy, in the Bay of Naples to be exact, a place I’ve wanted to visit for many years. We opted for an eight-day tour because we’ve learned from recent experience that popular sites are virtually impossible to enter without serious forward planning (of which we are incapable) and specialist companies secure priority tickets over individual tourists. 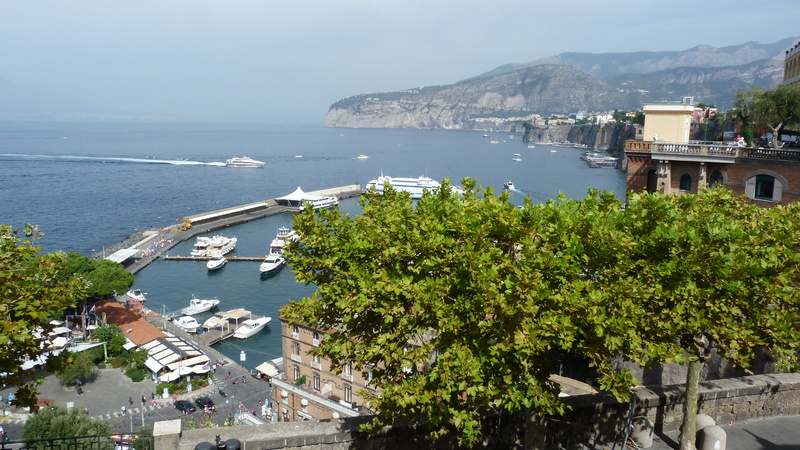 On first arrival I did begin to question that logic, especially when caught-up in rush-hour traffic along the Bay of Naples. Then we enter a series of tunnels culminating in a seven kilometre run which ejects us dramatically onto the rim of cliffs hovering above Sorrento and images of 1950’s movies starring Audrey Hepburn or Sophie Loren transpose my view. Azure seas lap beneath an undulating conurbation of white-washed villas clinging, rather haphazardly, to the cliff-tops; of course it’s entirely breath-taking. 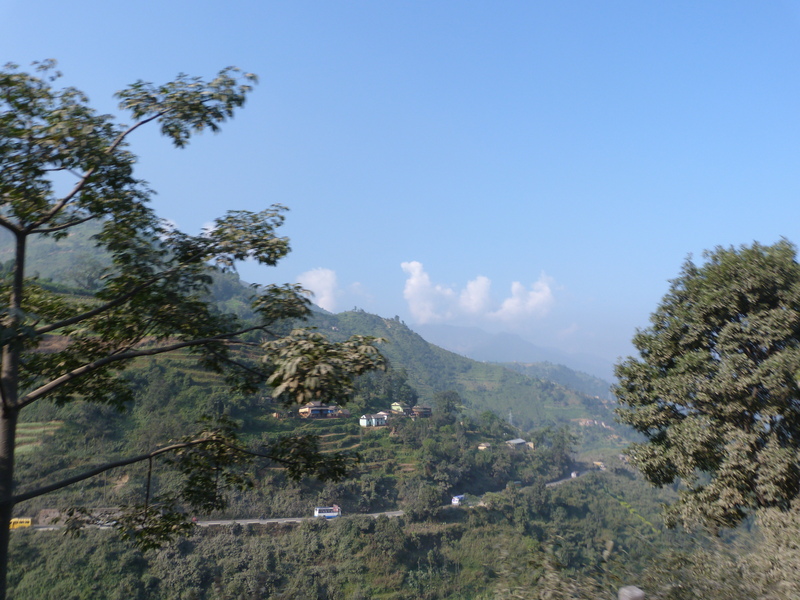 It takes another airless hour to reach our hotel, crawling through narrow lanes packed with traffic, negotiating hair-pin bends not designed for cars never-mind tour buses. We drop fellow passengers at city-centre hotels and wish our destination was closer. 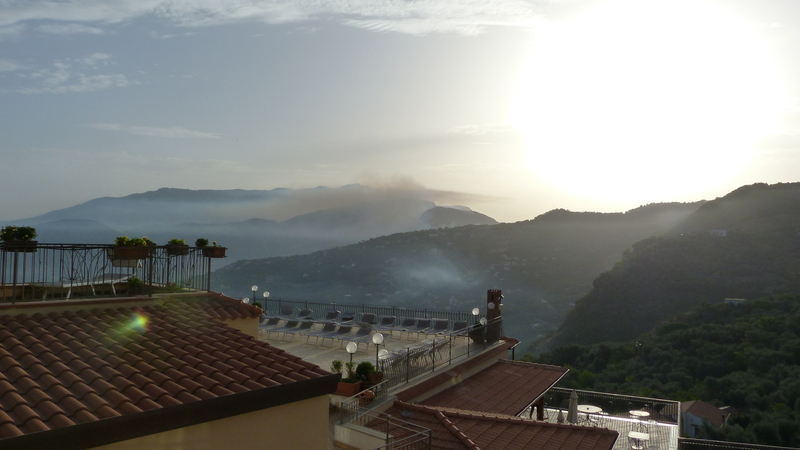 However our choice of accommodation proves worth the wait, we have the best view in Sorrento, high above the bay and tucked amongst high-staked vines and olive groves. Our home for the next week is the traditional, family-run Hotel Vue d’Or, and within minutes of our arrival we are flopped, like jetsam, on the marble-tiled balcony, sipping cold beer and expiring in the heat like true Anglophiles. Next morning, after a solid night’s sleep, our first day unwinds slowly. I sit on the balcony, writing down my thoughts and impressions. Although not yet nine o clock heat seeps down the mountains, crimping at the shade. Sunlight, unleashed, breaks with utter force, smothering, impaling, disturbing, discomforting. A distant mountain is ablaze. Soft grey smoke gathers, suspended like a balloon above the red glow of flames. The smoke sits slovenly and impassive. There isn’t a breath of wind. By mid-day the northern horizon hangs grey while small, bee-like planes skim across the smoke dropping buckets of water onto the flames. They seem an ineffectual nuisance. The sun’s brilliance filters through a smothering haze. But far below me sits a turquoise pool, shimmering invitingly. The hotel is clamped onto the mountain-side like a concrete rock, surrounded by red-tiled roofs poking through the dark green mantel of ancient olive groves. The air smells potently of charcoal smoke and hot-house herbs. The week holds a fast-paced itinerary. There’s no more time to sit and stare as the bus arrives to take us to our first destination. Worse, except for one other day, we have to be ready to leave by 7am. No leisurely breakfasts, no sitting by the pool and wondering if the fires will be subdued, we have an agenda to pursue. I begrudge the means but this is modern tourism, I can’t afford the time, never mind the wider elements of a true ‘grand tour’. Coming into Pompeii for the first time it was mind-blowing to think this city was seven centuries old before the great eruption of Mount Vesuvius in 79AD. Seven hundred years of trading with the known world, of ambitious families accumulating wealth and substance in a city perfectly situated for growth and expansion. Even though it now lies in ruins it still possesses an arrogant beauty. 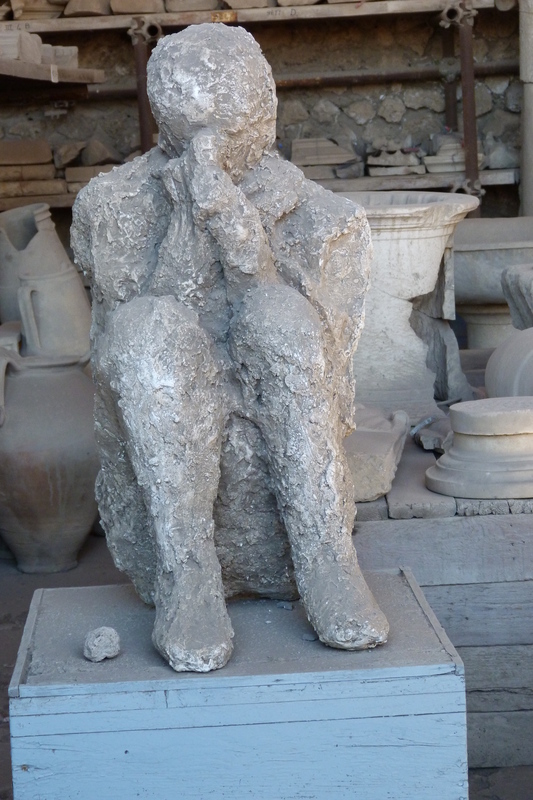 No wonder its citizens were reluctant to abandon their hopes when a series of earthquakes shook Pompeii’s foundations to the core ten years before the final destruction came. 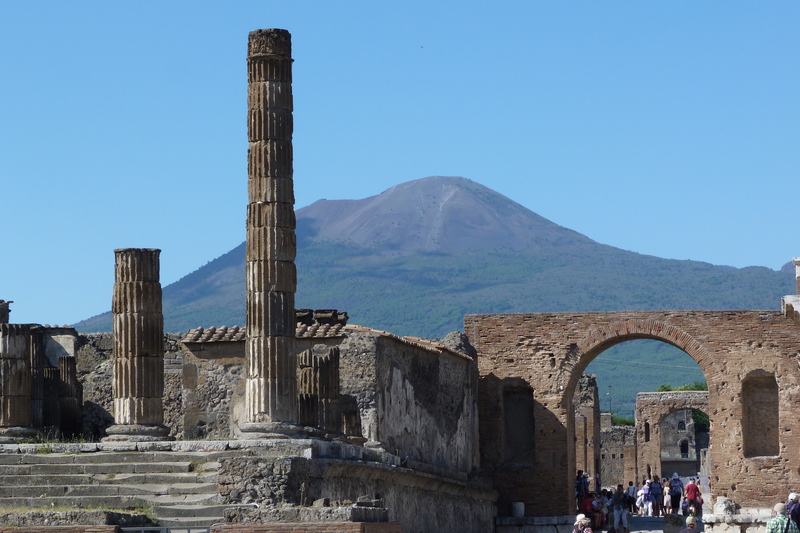 The forum, with Vesuvius lurking behind. Of course those with real money were able to leave, to abandon their villas by the sea. There is evidence they packed up their riches and left slaves to guard their properties. In fact one of the earliest finds, during the excavations of 1748, were the skeletons of several men who’d been trying to tunnel into the city not long after its annihilation. More recent archaeology has proved they were attempting to recover a large chest containing the combined household silver of a wealthy aristocrat. Historians think it quite possible there was the offer of a generous ransom but poisonous gases still pervaded the site, sealing the treasure-hunters’ demise. And they probably weren’t the only victims because local legend proclaimed the site not merely dangerous but ‘damned’. 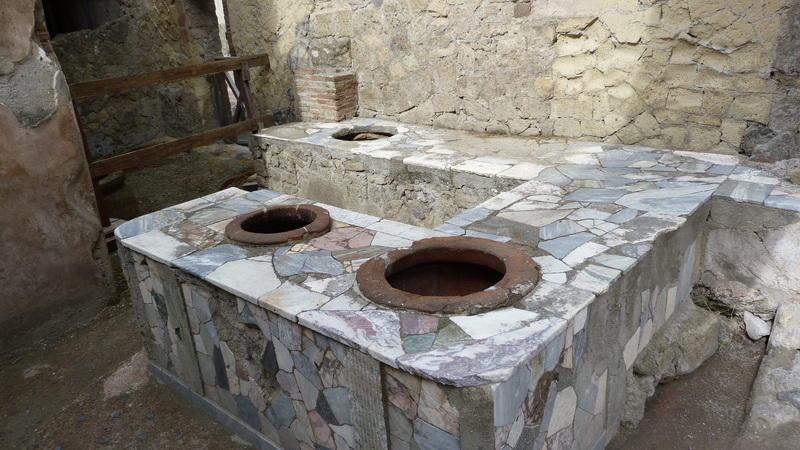 So Pompeii was largely forgotten. While boiling mud extinguished its existence, the massive eruption diverted the river which bound its wealth and subsequent lava-flows changed the lay of the land until the sea fell back from its harbours and the surrounding marshes became mosquito laden backlands where few dared to linger. I was startled by a small hand tapping me on the shoulder, not least because I was inside a traditional Gurkha restaurant in the city of Pokhara, Nepal, sharing a meal with a group of friends. 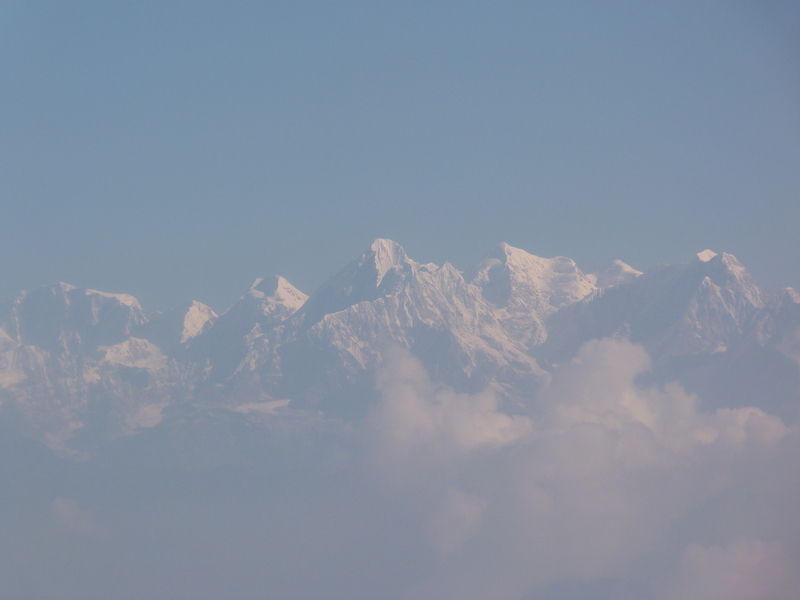 The city of Pokhara is small, and beautiful. It skirts a turquoise lake and sits at the foot of the vast Annapurna mountain range. After two weeks travelling through northern India and Nepal we seemed to have reached nirvana. That morning we’d been woken at 4am and packed into a taxi-bus. Bleary eyed we arrived in a little village set into the hillside above Pokhara, the best view-point (we were told) to ‘experience’ the sun rising on Annapurna. We weren’t alone. Fifty or sixty other tourists gathered in awkward circles, expectant yet dubious, waiting impatiently, not really convinced this ‘experience’ warranted getting up so very early. Then the snow-covered tips of the distant horizon shimmered gold as the first tenuous sunrays touched them with fire. Chatter became hushed, cameras stood ready, and expectations grew. Gradually the rim of crested peaks bled crimson under a velvet sky. Little by little colour flooded over the mountains until they blushed pink, like something half-dreamed. Well-travelled and worldly we might be, but this was nature at her most majestic. We were awestruck. That evening we decided to celebrate our experience and were tucking into a traditional thali meal when this small determined hand reached through the open window. Turning round to look I was surprised to find the smiling face of a local boy who, I guessed, was no more than ten years old. He didn’t look like a beggar. His clothes were shabby but his eyes shone with happiness. My friends laughed at his impudence. I handed him a bowl of vegetable curry and he drank it down in one gulp. I’d never seen anyone so obviously hungry. When he handed me back the bowl he nodded his head. The beaming smile never left his face. My friends passed over another bowl which disappeared as quickly but then a second boy, so alike he must surely be his brother, reached up on tiptoes, doe-eyes shy and frightened. We gathered everything that was left from our feast and handed it through the window all the time worried a waiter might chase the boys away. But when the waiter eventually came to clear our table he commended us on our excellent appetites. 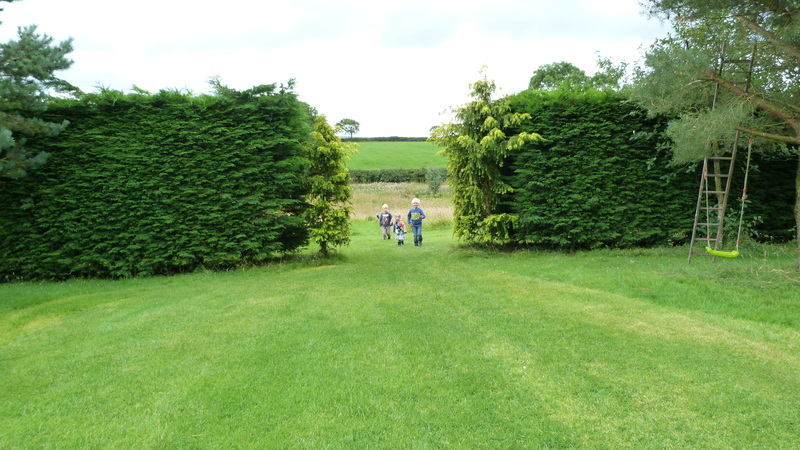 By then the boys had ducked out of sight. On leaving the restaurant we were given a handful of lollipops and catching sight of the boys a few streets further down the road, we handed them the sweets. They were the only beggars we met in Nepal and their beautiful smiles still haunt me. I wished I could bring them home and mother them. Later, when we told the story to our local guide, he explained the boys were probably not Nepalese but Tibetan. There are many communities of Tibetan exiles in Pokhara but they struggle to support new refugees who make their way through the mountain passes. News reports of the earthquake last week pricked my conscious. As a tourist, being able to travel to Nepal and witness the highest mountains in the world is amazing, but this awe-inspiring scenery also makes it one of the harshest environments on our planet. And therefore one of the most dangerous. A friend, Angela Locke, travelled to Nepal in 1992. She wrote a beautiful book about her experience – On Juniper Mountain – and inspired by the people she met set up a grass-roots charity called The Juniper Trust. www.junipertrust.co.uk If like me you want to help in some small way please consider donating to them, much of their work is achieved by volunteers.